According to Paul Ingrassia, editor at the Revs Institute for Automotive Research, there’s a saying in public relations: If you have to explain, you’ve already lost. That’s how he presents GM’s spat of bad PR in the wake of its announcement to idle three U.S. plants leading up to negotiations with the United Automobile Workers union in September. GM needs to take a different approach on the PR front, according to Ingrassia in a recent interview on CNBC’s Squawk Box. However, he also said GM’s decision to restructure its business to focus on emerging technologies such as electric and autonomous vehicles is the right move. It just looks terrible as Ford, BMW, and other automakers invest in U.S. manufacturing. Ingrassia several times brought up GM’s bankruptcy nearly a decade ago to iterate his point that GM cannot fall into the same trappings that led to its financial demise during the Great Recession. After the recession, there was a demand for small, fuel-efficient cars like the Chevrolet Cruze. Demand for sedans and small cars has fallen since then. Ingrassia said it makes little sense to continue to build a product people don’t want to buy—and he’s not wrong. No business can survive building a product that doesn’t sell. Ingrassia suggested GM should have entered a public-private partnership transitioning Lordstown factory employees from manufacturing jobs to fixing the infrastructure, a major talking point by both parties leading up to the 2016 campaign. However, that sort of coordination is unlikely. 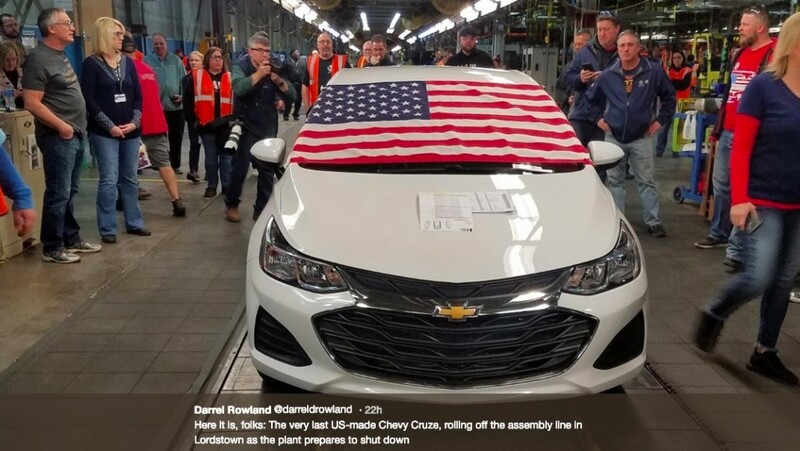 U.S. President Donal Trump has been vocal about GM’s decisions to idle production at the Lordstown factory. However, Ingrassia said Trump isn’t looking at the economics of the situation, adding that it’s hard to forecast consumers trends, such as rising demand for crossovers, SUVs, and trucks at the expense of small cars. That said, Trump’s sentiment echoes the opposite end of the aisle, seeing similar rhetoric from union leaders and Democrat politicians. Everybody unanimously agrees that GM should continue providing jobs at the plant, despite economic realities. There are also concerns from GM and other automakers that the boom in vehicle sales over the last decade is slowing. The boom lasted much longer than expected, according to Ingrassia, and GM is hedging its bets for the future. Where do they find these “experts”? Retrain to fix infrastructure. Why not retrain for careers in retail and fast food while you’re at it. The bottom line is Barra is incompetent and panders to analysts. The only way out of this for GM is to either sell the facilities to companies that will retain the workforce, or repatriate work to these targeted plants. How about Miss Mary Barra give up some of her millions in salary and stock options, not to mention private jets, for the “good of the company”? Hypocrite. Thank God we have a strong President now that cares about American manufacturing and workers. Great to see President Trump take Miss Mary and others to task over the issue. Go to love how GMA bloggers always have to take a jab at our President in their stories. A bunch of butthurt sore-loser children that never can seem to move on and be positive about America. all the garbage trump spews out of his own mouth is off limits now? good to know. GM should close Mexican plant that will build new Blazer and build it in a soon to close US plant. GM can sell the blazer in other countries without a import tax because mexico has import free tax agreements with many other countries. we don’t have them here so a blazer built in the USA can not be sold overseas without a import tax.. So what is this infrastructure that this analyst suggests GM have the Lordstown employees “fix”. I did NOT hear anything specific and/or concrete that he feels they should have done, other than the obvious point of Not closing the facility in the first place. This closing would never have been the issue it hS become had it Not been in Ohio, which is crucial to Trump’s re-election chances and of course the place where he made his pronouncements about all the jobs coming back and that people should not see their homes. Now that things have turned out differently, he looks like the empty suit that he is on so many issues like this.